This January, KOM welcomed two new faces to the office. Say hello to Elizabeth Archie, our new Opportunity Navigator through Minnesota Opportunity Corps, and Paul Sullivan, our new Communications Intern. 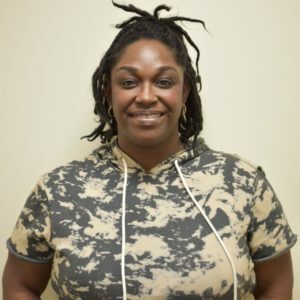 Elizabeth Archie started as an Opportunity Navigator through Minnesota Opportunity Corps at KOM in January 2019. A native of Texas, Elizabeth moved to the Twin Cities over a decade ago, and is excited to be working with both clients and staff at KOM while learning about the Karen culture. In the past, Elizabeth has worked as a case manager and employment specialist for disabled adults, and also as a pre-school teacher. She has been placed here though Minnesota Opportunity Corps, and began at KOM in mid-January. She chose her placement at KOM because of her love for working with different cultures, and her enduring commitment to helping those who need it. Why did you decide you wanted to work with KOM? I decided to serve my time here because I love working with different cultures, and I live to be of service to anyone who wants help. What will you be doing in your new position with KOM? I will be helping clients at KOM find what their passion is, whether it is through employment, school or a skilled trade. I am excited to be working with both clients and staff while learning about the unique culture here. I look forward to getting to know everyone at KOM through our shared experiences. 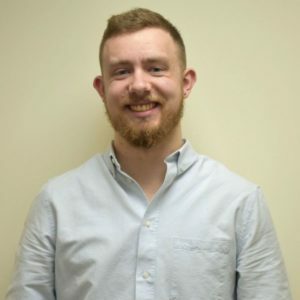 Paul Sullivan started as a Communications Intern at KOM in January 2019. Paul was born and raised in Decorah, Iowa, and graduated from St. Olaf College in 2017 with a major in Asian Studies and a minor in China Studies. Growing up in a multiracial family, Paul has always been keenly interested in how different cultures interact with one another, especially within the context of the American immigrant experience. As an undergraduate, Paul channeled this interest into his Asian Studies degree and immigration activism on campus. After graduating, Paul served for a year as St. Olaf’s China Fellow at East China Normal University in Shanghai, China. He came back to the Midwest in August of 2018 to explore a career at the intersection of his passion for immigration activism and his degree in Asian Studies. KOM, with its mission of providing services to the Karen community and other refugees from Burma, seemed like a perfect fit. He is very excited to intern at KOM, and hopes to learn valuable skills that will allow him to pursue a career in the nonprofit field. Why did you decide you wanted to intern with KOM? After living in China for a year, where I wasn’t really able to participate in any form of civil society or activism, I came home determined to explore a career in the nonprofit sector. When I began to look online for jobs or internships in the Twin Cities, I found KOM’s communications internship. After reading some more about KOM’s mission, I realized it was the perfect opportunity to simultaneously learn more about nonprofit work and about one of Minnesota’s fastest growing refugee-experienced communities. What have you been doing since you started working with KOM? So far, I have been familiarizing myself with KOM’s social media accounts and website, making posts on Facebook and Instagram, and working on the January newsletter. Otherwise, I’ve been trying to plan out what projects I’ll tackle next. What are you most looking forward to with your internship at KOM? I’m looking forward to working with all the amazing staff I’ve met so far at KOM, and to learning more about Karen culture! Hopefully I can help KOM both serve the Karen community and raise awareness of the Karen’s story for others.